After defeating Zimbabwe in the third ODI, Pakistan is all set to take on Zimbabwe on Friday, July 20, 2018. In Today’s Dream11 Cricket Match Prediction PAK vs ZIM 4th ODI, we will cover Pitch Report of Queens Sports Club, Bulawayo, Probable Playing 11, Fantasy Cricket News, Toss Prediction and Who Will Win? Who Will Win the 4th ODI Match, Between PAK vs ZIM and Toss Prediction? Where Can You Watch the Live Streaming of PAK vs ZIM, 4th ODI or Channels to Watch? If you still trying to find out who will win the match of PAK vs ZIM then you don’t need to go anywhere else. There is no doubt that Pakistan will win the match and according to our astrology prediction also PAK will Win the match. It hardly matters to Pakistan if they win or lose the toss as the match result will go in their favour. According to our astrology prediction, PAK will win the toss and ask ZIM to bowl first. Date: The match will be played on the 20th of July 2018 (Friday). 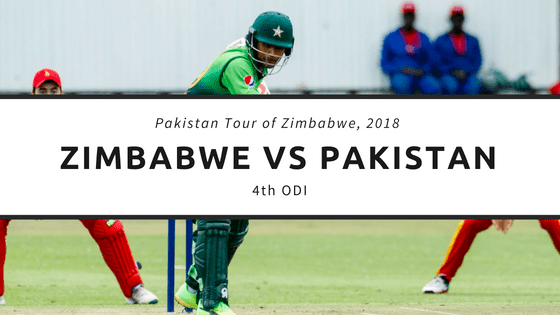 Match: Pakistan Tour of Zimbabwe, 2018, ZIM vs Pak, 4th ODI. Venue: Bulawayo, Queens Sports Club. Time: 07:15 AM GMT, 12:45 PM IST, 09:15 AM Local. The pitch will be almost the same on Friday. The PAK seamers will get help from the pitch and the Pakistan batsmen will take maximum benefit from the pitch. If Pakistan bats first, a high score is expected. It is predicted that Pak will bat first. Note: If you know how the pitch will play, then you can select your team according to the pitch. Make use of the pitch while selecting your team for fantasy leagues. From the above pitch report, you would have understood that keeping top order batsmen and Seamer in your team would be a wise choice. The sun will be out and it will be a sunny day throughout the day. The sky will be clear and there is no sign of rain. The cricket fans and fantasy users can see the complete game. The temperature is expected to be 10-Degree Celsius and the humidity to be 72%, which may go down to 40%. Note: Due to the weather condition the batsmen will be benefited and the spinners will also get some help from the pitch. The average first inning score of this ground is 234. The average second inning score of this ground is 203. Highest total on this ground is 397/5 in 44 overs by NZ vs ZIM. Lowest total on this ground is 67/10 in 25 overs by ZIM vs PAK. If you are a Zimbabwe fan then the statistics will definitely make you unhappy. As in last five matches. ZIM has won the only match and Pakistan has won four games. In the last encounter, Pakistan has defeated Zimbabwe by 9 wickets with 241 balls remaining. In overall encounters, PAK has won 50 matches and ZIM has won 4 matches. Sony Six and Sony Six HD has the exclusive rights to broadcast the live coverage of Zimbabwe vs Pakistan, 5 match ODI Series (One Day International) in India and its Subcontinent Countries like Afghanistan, Bhutan, Sri Lanka, Bangladesh, Maldives, Nepal, and Pakistan. The change they made in the previous game proved to be a wrong decision. It backfired to them only. It is very much possible that they will go back to the same playing 11 which played the first two matches. Chamu Chibhabha, Tarisai Musakanda, Peter Moor, Liam Roche/Tendai Chisoro, Tendai Chatara, Brian Chari/Prince Masvaure, Hamilton Masakadza (capt), Ryan Murray (wk), Donald Tiripano, Wellington Masakadza, Blessing Muzarbani. Chamu Chibhabha, Tendai Chatara, Prince Masvaure, Blessing Muzarabani, Liam Nicholas Roche, Hamilton Masakadza(c), Brian Chari, Elton Chigumbura, Tarisai Musakanda, Wellington Masakadza, Peter Moor, Richard Ngarava, Ryan Murray(w), Tinashe Kamunhukamwe, Tendai Chisoro, Donald Tiripano. Pakistan could do two things, either they will give the bench players a chance to play as they have already won the series or they could play with the same team as the players didn’t get that much opportunity in the previous game. We are assuming that they will go with the same playing 11. Imam-ul-Haq, Shoaib Malik, Sarfraz Ahmed (capt & wk), Faheem Ashraf, Junaid Khan, Fakhar Zaman, Babar Azam, Asif Ali, Shadab Khan, Yasir Shah, Usman Khan. Fakhar Zaman, Usman Khan, Mohammad Nawaz, Imam-ul-Haq, Mohammad Hafeez, Babar Azam, Faheem Ashraf, Shoaib Malik, Yasir Shah, Asif Ali, Sarfraz Ahmed(w/c), Mohammad Amir, Junaid Khan, Shadab Khan, Hasan Ali. Conclusion: This is it for Today’s Dream11 Fantasy Cricket Match Prediction of PAK vs ZIM, 4th ODI Match, which will be played on Friday 20th July. We have covered all the details required to win any fantasy leagues. We have covered players recent and past performance, dream11 guru and crictom prediction, all the latest news and updates of Pakistan Team and Zimbabwe Team, weather report of Bulawayo, dream 11 best teams, keys players, the best choice for captain and vice-captain, where to watch the live match of PAK vs ZIM, 4th ODI and the details of live streaming of Pakistan tour of Zimbabwe, 2018.